0. What functional, What basis set? 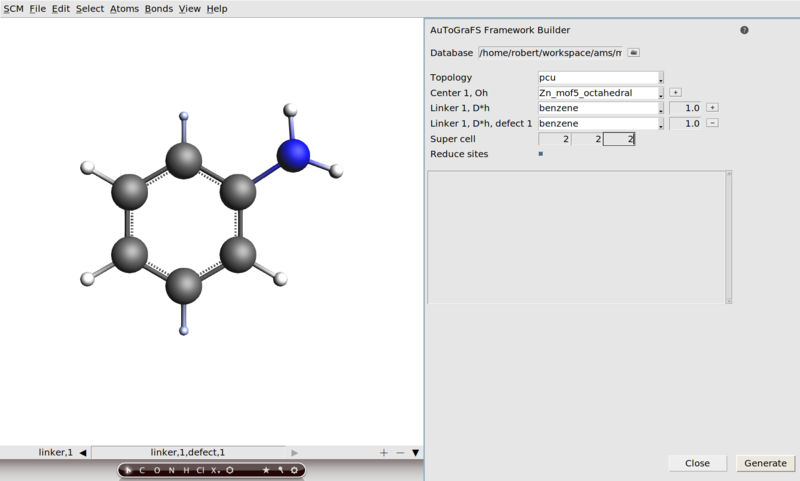 In this tutorial we show to the user how to generate a framework compound through the GUI. These compounds are issued from reticular chemistry, and have received a considerable amount of attention from the scientific community. Well-known families of these compounds are Metal-Organic Frameworks (MOFs), Covalent-Organic Frameworks (COFs), Zeolites, etc. 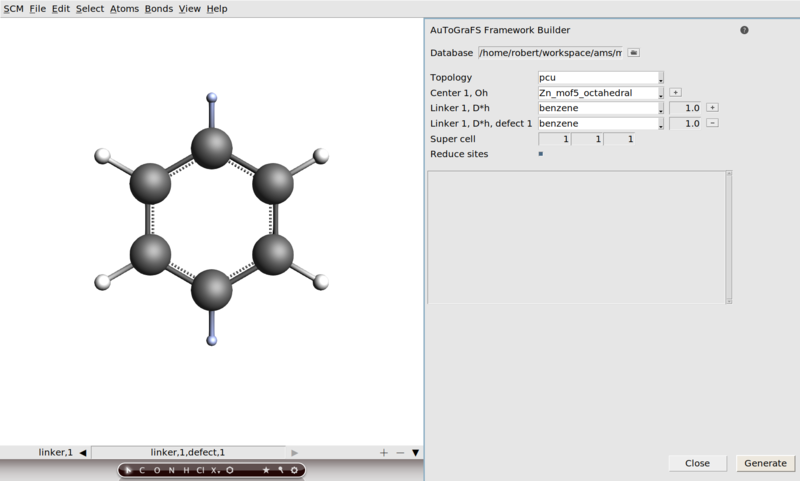 If you are not interested in periodic structures (for example, if you only use ADF), you can skip this tutorial. The export tool for custom building blocks. While a small database of building units is shipped in the ADF suite, you might need to generate your own collection of parts from which to generate you frameworks. The first step is to create a directory in which these parts will be stored. In the following tutorial, it will be the “~/Desktop/my_database/” directory. Then we start the process of creating and exporting the units. 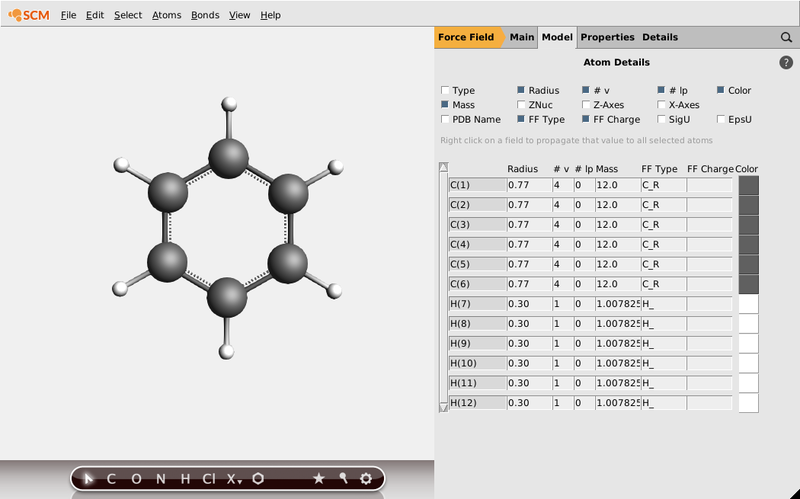 Next make sure to maximize the symmetry of the molecule using the star button. Check that the bonding information is correct. Switch to the UFF -> Model -> Atom Types menu, and fill out the corresponding UFF atomic types. These will be used in the post-processing optimization of the frameworks. Finally, specify the connectivity of your fragment using dummy atoms. You can now export the fragment to your database. Select the corresponding geometry. Here, linear. Do the same for bipyridine, and export a zinc paddlewheel with the octahedral shape. Note the importance of correctly assigning UFF types to dummies in the bipyridine and the paddlewheel, to specify the exclusive type of connectivity in pillared objects. Dummies connecting to nitrogen should have a nitrogen type, and those connected to carbon a carbon type. Guess Types can be used for a good initial guess. 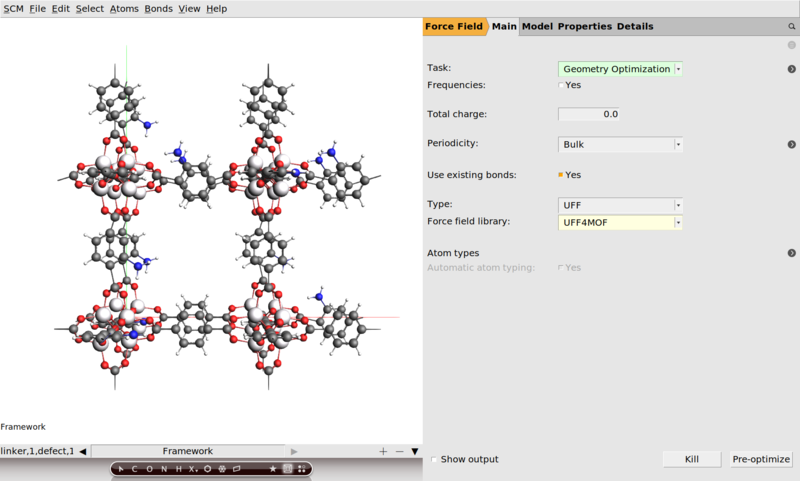 You are now set up for generation of at least one cubic MOF, with three files in my_database : benzene.inp, znpw.inp and bipy.inp . Close the framework builder and optimize using UFF for parts to snap into place. Do not forget to optimize the lattice vectors also!